Are you wondering which is the best pregnancy pillow on the market? Or are you not quite sure if it’s worth buying a pregnancy pillow? Since announcing your pregnancy, you’ve probably received advice from friends and family members – and from the cashier at your local supermarket. Everyone tells you about the best pregnancy pillow money can buy. Apparently you can’t live without one. 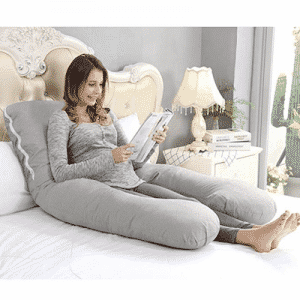 On the one hand you might be wondering whether it’s worth spending the money on a special pregnancy pillow. After all, you already have plenty of normal pillows at your disposal. In fact, whether it’s worth it or not will depend on how much money you have to spend, how uncomfortable you are at night and how much you value your sleep. For example, some women claim they couldn’t have coped without the best pregnancy pillow they could buy. 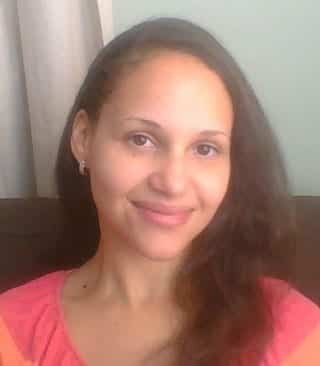 Others say it helped them sleep well – even towards the end of their pregnancies. And other women have been perfectly happy using a few regular pillows wedged around them during the night. What Does A Pregnancy Pillow Do? Your body goes through a lot of changes during pregnancy. Your breasts get bigger, your bump starts to grow and you might find it tricky to keep your balance as your centre of gravity shifts. All of these changes can put a strain on your body. By the end of a busy day, you could be suffering from aches and pains. The aches and pains might change as your pregnancy progresses. Many women complain about lower backache during pregnancy. Getting comfortable at night can prove challenging as you near the end of your pregnancy. Finding a position that offers the right support can be tricky, and you might find yourself wedging pillows around you in an attempt to get comfy. 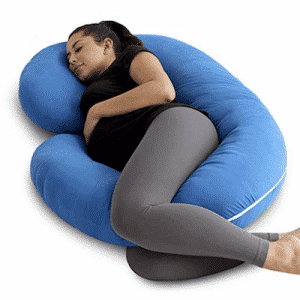 If you’re running out of spare pillows, a pregnancy pillow could be just what you need. The best pregnancy pillows are usually longer than regular pillows, and they come in all shapes and sizes. They’re specially designed with pregnant bodies in mind, and they will provide the support you need as your bump grows. They’re also designed to follow the length of your body, and you can wedge them under the bits of you that require extra support. The great thing about pregnancy pillows is they’re versatile and you can use them in a number of ways. Many women swear by them as a way of getting a decent night’s sleep. Really, is there a better time to treat yourself? At the time of writing, this is the top-selling pregnancy pillow on Amazon. It’s a giant U shape, which allows you to sleep in the middle, and be supported on both sides. The filling is Bionic Polyethylene, which retains its fluffiness. You can also use it as a breastfeeding support pillow after the birth. The U-shape means you can roll over in bed – not easily, you are pregnant after all – without having to rearrange your pillows. However, the downside to this design is it takes up extra space in your bed, which your partner might not be too thrilled about. Order the Queen Rose pregnancy pillow here. Please note, there are various options available, so browse the full Queen Rose collection before you make your choice. This C-shaped pillow will hug you to sleep in comfort. It’s available in a choice of colours, and is arguably one of the more stylish pregnancy pillows on the market. If you’re looking for a comfortable pillow that won’t look awful in your bedroom, this might be the pregnancy pillow for you. The C-shaped pillow provides bump and hip support. At the same time it will curve along your back, and provide comfort there, too. The fabric is soft and machine-washable. After the birth it can also be used as a breastfeeding pillow, so you could argue it’s a long-term investment. This is one of the more affordable pregnancy pillows on the market, so it’s perfect if you’re on a tight budget. You can purchase the PharMeDoc Pregnancy Pillow here. Another best selling U-shaped full body pregnancy pillow. 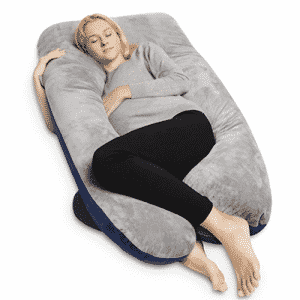 The shape follows the natural curve of your body, allowing you to feel supported in bed. Its full shape allows you to get support where you need it most. The pillow can also provide good back support while you’re sitting on a sofa. After the birth, it doubles up as a breastfeeding pillow. However, the pillow is quite big, and your partner might refer to it as your fortress. Whether this is a good or a bad thing will depend on whether or not you prefer having your own space in bed now that you’re pregnant. You can order the AngQi full body pregnancy pillow here. The Meiz pregnancy pillow is another U-shaped design that will provide comfort for both your front and back while you sleep on your side. The shape of the pillow provides support to your bump, hips and back. The long legs can help you sleep in a more upright position, allowing you to ward off heartburn and indigestion. The pillow is ideal for those who toss and turn throughout the night. Do you suffer from back pain during the day? This pillow will support you when you’re sitting up to watch TV or read a book. The versatile shape means there are lots of different positions you can try to find the one that’s right for you. 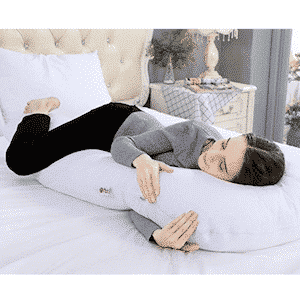 You can buy the Meiz pregnancy pillow online here. 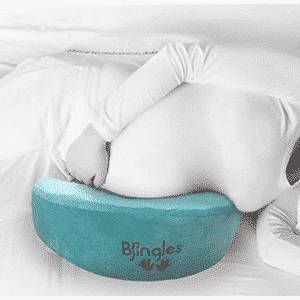 If you’re not willing to relinquish most of your bed to a pregnancy pillow, you need the Bjingles pregnancy wedge pillow. This space-saving wedge fits perfectly under your bump, allowing you to feel supported all night long. Switching sides in the night is so easy because of its compact design. The Bjingles Wedge provides belly support while you’re sitting at a desk or on the sofa. With its cool and cosy foam layer, it encourages airflow to stop you feeling too hot during the night. It even comes with a travel bag so you can take it on holiday with you. Some mamas use it between their knees instead of under their bump for a comfortable night’s sleep. 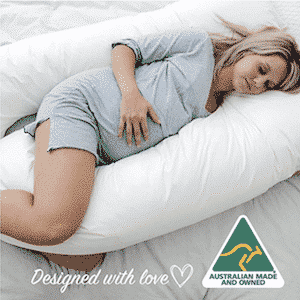 You can order the Bjingles pregnancy wedge pillow here. If you’re after the very best pregnancy pillow in Australia, you can’t go past the Woolcomfort Pregnancy Pillow! Support local jobs – the Woolcomfort is 100% Australian made, with a soft and durable organic cotton case. It comes with a one year warranty and a machine washable, zipper case. Only the best for you and your baby. Amazon’s Choice for pregnancy pillows in Australia. Grab your Woolcomfort pregnancy pillow here.